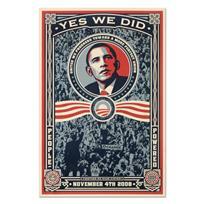 Shepard Fairey, "Yes We Did! (2008)" Offset Lithograph Marking Barack Obama's Historic Victory with Letter of Authenticity. "Yes We Did! (2008)" is an offset lithograph on cream speckle tone paper by Shepard Fairey. This piece commemorates Obama's historical presidential victory. Includes Letter of Authenticity. Measures approx. 24" x 36" (image). American contemporary street artist, activist, and illustrator, Frank Shepard Fairey (born 1970) emerged from the skateboarding scene when he started the "Obey Giant" sticker campaign in 1989. Shepard started by placing stickers on his skateboards and in public places around Rhode Island where he was attending art school. The stickers had no meaning but were intended to inspire curiosity and cause people to question their relationship with their surroundings. His campaign started locally but gradually grew via an international network of collaborators. Later, Shepard became widely known during the 2008 presidential election for his Barack Obama "Hope" poster. The Institute of Contemporary Art, Boston has described him as one of the best known and most influential street artists. His work is included in the collections at The Smithsonian, the Los Angeles County Museum of Art, the Museum of Modern Art in New York City, the Museum of Contemporary Art San Diego, the National Portrait Gallery in Washington, D.C., the Virginia Museum of Fine Arts in Richmond, and the Victoria and Albert Museum in London. 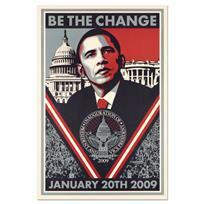 Shepard Fairey - "Be the Change" Barack Obama Inauguration Lithograph, with Letter of Authenticity.